Like Mac Book, iPhone, iPad, iPod, Apple Watch and so on, there would be some people among dear readers whose room abounds with those Apple products. Although you don’t have all of them, I think you have at least an Apple. I also have an iPod which is a must-have item when I go walking. To the chagrin of Bill Gates, Apple has always gotten ahead of times since launching Macintosh computers. Steve Jobs that everyone knows the name founded this prestigious business giant. 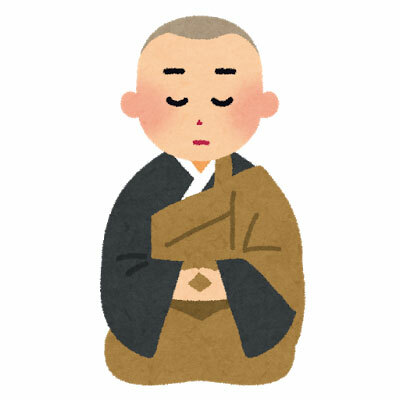 When he was young, however, this guy somehow tried to become a Zen Buddhism priest at the temple named “Eiheiji” (Image 1) which sinks down into the deep snow in winters. Apple devotees and our usual users are now glad that he finally quit his eccentric behavior. My only concern is just that what part of Zen enchanted the genius? Why do they remain seated? Bodhidharma was born in India and a Buddhist monk during the 6th century. He particularly emphasized Zen practice. 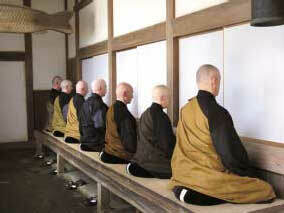 From this angle (Image 2), you cannot see monks’ faces. In fact they sit silently with their eyes closed. It is not to say that they have a special ability to sleep while sitting. They are in the midst of the Zen practice. For what do they this discipline? At the beginning, I would like to give a brief explanation of the teaching of Buddhism. The Easiest Lecture on Buddhism! Although Buddhism has various “denominations”, its common and ultimate purpose is to reach “satori”. (This term can be called enlightenment.) It refers to the one’s own inner being released from worldly desires such as suffering and ambivalence. Buddha taught human life is suffering, which is not caused by extraneous factors but by internal ones of human mind itself. Let’s take an example. Suppose that you are head-over-heels in love with a girl. And she accepts your proposal. However, it generates new anxiety as to whether or not she loves you forever. Suppose you become a lawyer. You fly into raptures when passing a bar exam. From then on, sadly, you will find yourself in a precarious position as to whether or not you can win cases. Fundamental question is that the birth of human beings leads to death. Our worldly desires and ambivalence stem from the perception that this natural relation of life and death, in other words cause and effect, is regarded as suffering. A cause inspires next human action and the effect again inspires another cause. Unless you realize that the chain of actions is triggered by your worldly desires, you are not able to be released from suffering. What should we do to break out of the vigorous circle? One of the answers and methods is Zen. Some people parallelize the condition of human mind taught in Buddhism and in psychiatry of Freud. Well, Zen is not just mysteriousness, but the practice of logic. Which Do You Choose, Military Service or Becoming a Zen Priest? The building of 10 is the image 1. The satori that is free from suffering and ambivalence is attractive, but it is not easy to achieve. To reach satori, it is better to surround ourselves with a calm environment which blocks out worldly thoughts. At the temple in the heavy snowfall area, over hundred disciplinants continue their practice. However, looking at the daily schedule above, I can’t take it! It is very difficult for me to get up early morning, let alone AM. 3:30 still being dark! Moreover, Zen meditation, reading the sutras, and cleaning have to be done all the day. To make matters worse, especially for me, monks are forced to lead their lives as vegetarians. Daily diet is served by monks specially in charge of cooking. It is also important Zen practice. Drinking alcohol is out of question. Oh, the life without drinking is impossible for me at all! Which is tough, soldiers or Zen monks? Priests can get days off on the days of 4, 9, 14, 19, 24, and 29. However, it is not to say that they can go to the Tokyo Disneyland. They finish off miscellaneous chore which they usually can’t do like shaving their heads and taking a bath. Permitting out is only in mendicant. Buddhism prohibits human beings from taking any life. Care for every life is considered to be one of the most important teaching. This is wonderful thinking but ordinary man like me has a troublesome question. Zen is thorough about this, therefore completely prohibiting meat-eating. There is more! Vegetables with strong smell such as green onion, Japanese long onion, chive, rakkyo, and garlic cannot be eaten because they smell very strong. Zen sitting keeps down human attitude of the heart and diet restriction mortifies physical comfort. The only solace is that the recipes are seasoned. When you actually in the Eihei-ji temple, delicious meals like the photo of image 9 are never served. In the mornings, you can eat only rice gruel, pickles, sesame and salt. (See the link.) In the afternoons, boiled barley, pickles, miso soup, and fried vegetables with much sesame are served (See the link). In the evenings, boiled rice with vegetables, pickles, soup, simmered vegetables and fruits are their dinner which is unbelievable frugal. (See the link.) A handful of monks in the early days of practice are taken by ambulance to a hospital due to malnutrition. However, once they get used to such diet, they can keep their good health. Human’s ability to adapt to a new environment is beyond our imagination. The photo of image 9 is Zen vegetarian diet served in a Japanese style inn. It is hard for big meat eaters to have the dish everyday but it is good for your health to cook and eat the vegetarian food once a week. As for me? Please give me some time to think. How about Having an Experience of Zen Practice! My explanation might make you afraid of Zen practice. Sorry. However, Eiheiji Temple I have introduced is said to be the strictest Zen training monastery in Japan. It provides a two-day Zen experience program but the website displays a message that people just out of interest and sightseers cannot participate. But then, beginners like me might give up halfway through there. But don’t be disappointed! There are numerous places where we can experience Zen practice. If you would like to do so, real temples are recommendable. Eiheiji is the head temple of the Soto school of Zen Buddhism whose fifty eight branch temples receive English-speaking visitors. 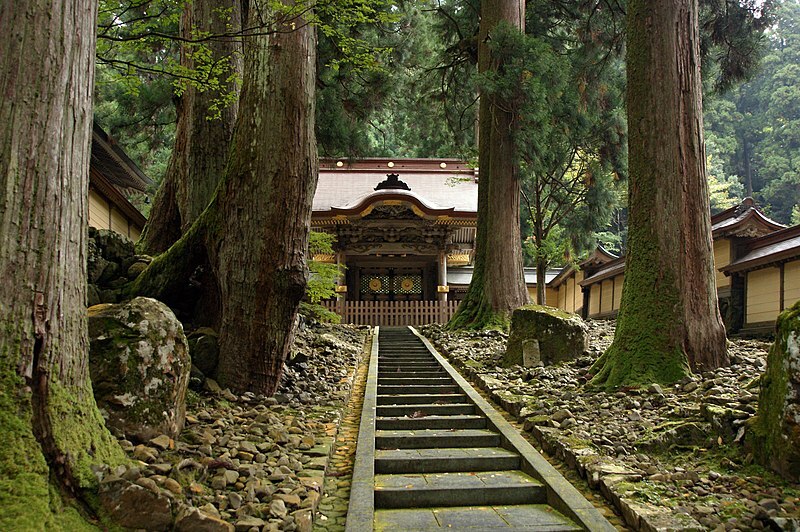 This link provides information on respective temples, where you can communicate with Zen monks in English. When you are interested, let’s check and see. In this garden there are 15 stones and sand which represent mountains, islands and water flow respectively. However, you cannot recognize every stone from any angle. It means human beings are not perfect existence, therefore cannot perceive everything as it is. The theory is embodied in the dry-landscape garden. Perfect lovers, jobs, and human lives do not exist. Our suffering stems from the fact that we seek non-existence like those. As we cannot see every stone in the garden, there are invisible parts of the world. It is also applied to our own selves. Zen, as it seems complicated, is easily understood by logic. However, to practice Zen, we have to overcome various barriers which are obviously our inner selves.